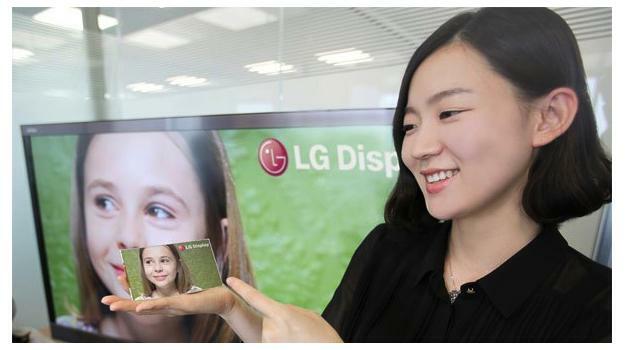 LG has announced it will be launching a new 5-inch LCD screen later this year, and that it will have a 1080p resolution and a pixel density of 440ppi, a marked improvement over the current range-topping screens. Specifically designed for “smart devices,” LG’s screen uses AH-IPS technology — that’s Advanced High Performance In-Plane Switching, acronym fans — allowing a wide viewing angle, fast response times and a realistic color palette. The resolution is 1920 x 1080, which is more commonly found on HDTVs and high definition monitors, and the 5-inch panel will have a 16:9 ratio. LG say it’s the first time full HD resolution will be possible on a smartphone, and it’s certainly an exciting proposition, however the 440ppi pixel density is equally as headline-grabbing. LG hasn’t announced a phone to accompany the new screen yet, but given its size, it’ll probably find a home on a tablet/smartphone hybrid, along the lines of the Galaxy Note and LG’s own Optimus Vu. A sequel to the Vu is a possibility, as although there has been talk of an international release, it so far hasn’t strayed far from Korea. It’s doubtful that LG’s 4:3 ratio Vu could challenge Samsung’s Galaxy Note now anyway, given the head start it has had; but an Optimus Vu 2 with a 16:9 ratio, 5-inch,1080p screen could turn more than a few heads. The screen will make its debut at a display trade show next week, and LG says it’ll be released during the second half of 2012. No doubt we’ll see Samsung’s response to it in the meantime.